offerta su barre v7 e v8 se acquisti il kite! 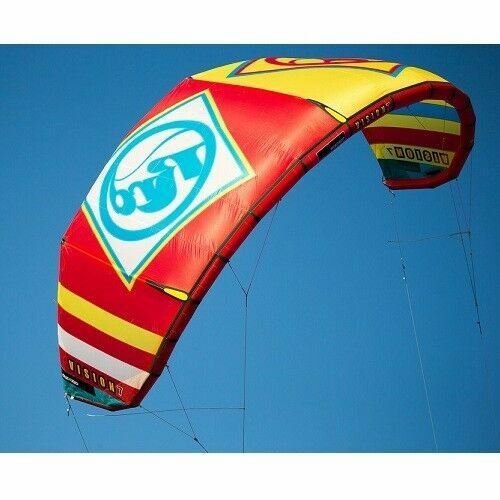 Totally fresh, the Vision has had a re-draft as one of RRD’s entry level kites. Introduced to the range five years ago, the Vision is designed to offer a little more all-round playability than the Passion, and fits our remit for this test perfectly. The bar is new this year after a long wait for an upgrade, the Global V7 bar offers a similarly clean layout, but features all new parts and materials, and looks fresh in white and orange. There’s a smooth trimming cleat above the bar, which we’re always fans of with a Velcro tab to stop the trimming line swinging around when you have the kite heavily trimmed. Below that is a big stopper that doesn’t completely stop the bar depowering if you choose to use it, but does help ease fatigue in your arms, so it’s nice and safe. The soft bar ends are a welcome addition, the chicken-loop release is essentially the same with a clean and robust push away collar system but the chicken-finger is new. Rotating in stages around a full 360, you can position it exactly where you want – out of the way for freestyle, or in the middle for hooked-in riding. It is quite pointy though! The safety line runs through the centre of the chicken-loop and offers a good size ring to leash safely onto, and can easily combined to the chicken-loop for suicide too. The bar is still only available in one size, but RRD assure us that they do this so that each kite is always perfectly tuned to any RRD bar you ride, which makes sense. Overall this system is super clean, very well made, good looking and functional. Looks much more modern than the last one, too.